A beautiful house where stay during the time in UK comfortable and familiar atmosphere; thanks Amy for arrange this place! Wow! and the Pilates Mat Class; let me at the Paradise of the Flow! Thanks Andrea and Karen you rock my mat skills! Be able to spend extra time in order to “Observe” observe in silence what a difficult part for me hahaha; yes I know I am doing my best… believe me! Spend time at the Studio with Amy Kellow from www.everybodypilates.com and observe Classical Pilates Sessions, Privates and Group of Classes. To see how everybody is teaching the Joe Pilates Philosophy, how they move, how the connecting all again, and the most important is to see a great teachers they are there for you! The King of the Equipment: The Cadillac and how we are going to connecting our entire body, mind and soul with the movement of the springs. The gravity and concentration must be at our side. Andrea Maida show us the elixir of the Cadillac! Learning from the root to the sky! 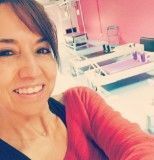 moving with flow; The Classical Pilates is moving me again and again day by day and I need to say thanks to all my Pilates teachers in the past that bring me here today! Meeting again Andrea Maida from www.pilaesandrea.com and Vintage Pilates in Usa. 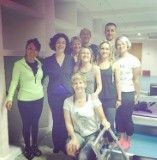 I met Andrea last year at the Classical Pilates Conference in Windsor UK with Amy Kellow and Mr. Jay Grimes. then I was able to meet her again at the Spring Camp at Vintage Pilates in USA this year in April. The sparking way that she teach was wonderful and connecting me as a teacher more and more; to keep to be present student always. Yes we need to remember that! Meeting again Karen Frishmann from Vintage Pilates and www.karenfrishmann.com was very important in my own Path, a year ago I met her for the first time at the Classical Pilates Convention in Windsor, UK; I remember when she ask me to performance the “Elephant” … well my elephant was sleeping at that time. I met Karen at the Spring Camp at Vintage Pilates this year in April 2015 and she give me the best advice “Patience” and today she still give me the same advice. She knows for sure. The Elephant capture movement by eyes of Amy Kellow, and yes I am moving again..
Today met her again and be able to move with flow and freedom, made me think that my heart is my best guide. Yes I am doing my best and of course I have amazing teacher at my side: Amy Kellow her acknowledge, time, patience and support and of course she teach me every week via Skype lessons by lessons and she knows when I am there! Also Training and learning all over again at the Classical Pilates Method. And discovering every day how simple and flowing is “Contrology” I move from the Contemporaneous Pilates to the “Classical Pilates Method” for personal necessity because I am a mover! To be able to participate to all this days, Observing, learning, moving, sharing our passion for Joe Pilates Philosophy and of course to be able to meet such a greats teachers around the planet. Moving with flow, finding my Qi energy in the way I am moving in my mat at my Reformer and of course connecting my “Elephant” with the Qi energies that move and rock my life today. Amy Kellow will be in Qatar this November to sharing with all the Simplicity of the Classical Pilates! Thanks Joe! for bring me such a wonderful teachers in my Path! “Let Move with Efficiency and let keep the mouth shut!